Showing results for tags 'Reaper miniatures'. Lidless Eye Hobbies: Attack of the Deranged Mutant Killer Monster Snow Goons! While it's still winter, I thought I should finish up my last ReaperMas order: The MONSTROUS SNOWMEN! Lidless Eye Hobbies: Happy Holidays! Last up in my recently finished miniatures are a set of Animal-Folk from Reaper, all part of Bones 3. I believe some are Lyncanthropes and some from the Savage Avatars sets. The pack: The Gorilla King, with hat: And without: The Were-Gorilla: Werebear don't care: A rather standard Werewolf: Wereboar gotta go fast: And a Water-Buffalo-Man. I realized I painted him after a Yak, then remembered that's not the animal he was meant to be. After sitting on this guy for 14 years (ugh) I finally finished him up when I realized he'd be perfect for my Trollkin Paladin for an upcoming "Midgard" game. Reaper's "Reaper of War"
Hi all I got these guys finished up about 2-3 weeks ago, and am just now getting to posting them. For Damar I tried to make mine look similar to another mini that someone had painted and posted. I changed up some of the smaller details to make mine bit different. For Damiel, I think his leather ended up too dark, for my current group of mini's I'm using a much lighter base color. Should I have made the bottles more reflective? The next group of mini's I've done the Zenithal style priming on them, so I'm hoping that the shading ends up being better on them. I'm done priming my mini's in straight black, there's just so much undershading that I have to do. Also for the inspiration gallery, does it have a different login than the forums? Thanks! I hadn't even realized when I began on these three that they were all from the "Castle Stoneskull" expansion from Bones III. It was a great set for adding to the random encounters for an RPG. These guys may represent some of the high-level dangers that one could encounter while dungeoneering in Castle Stoneskull! The Behir. I've been wanting one since a buddy pulled one from the first Huge set of D&D prepaints. They even show up in Pathfinder's "Reign of Winter" and D&D 5E's "Storm King's Thunder", if only I had had this guy in time for those campaigns! Brain-in-a-Jar. While I was hoping this would be a human brain, it's still a really cool design. I wonder why the legs are traditional bendy bones instead of the hard plastic that makes up the rest of the mini (minus the squishy brain), though. The mighty Minotaur! Bones has a lot of representations for Minotaurs now, almost as many as Orcs or Goblins. There's the one from pre-Kickstarter, 2 adventurers in Bones II, and the whole set of Minitaurs coming in Bones IV! Plus all the Beastmen if you want to count them, I've seen them used as medium Minotaur PCs enough times. This guy is my favorite, though. Must be the Gladiator armor. For the most recent works in progress, a gigantic distraction from my poor Death Guard project. In the last week, multiple delayed Kickstarters (and one on-time Nickstarter) arrived...as well as the ReaperCon Swag Bag! Arrivals included: Stonehaven Miniatures Giants Stonehaven Adventurers 2017 Midlam Miniatures "Winter Adventurers" Reapercon Swag Bag Frostgrave: Ghost Archipelago Nickstarter While I am trying to complete the Death Guard, I did ready these groups for prime time: The Giants are nicely sized. While there are some issues with the scaling between Giant "tribes" in comparison to 5E entries, they do tower over adventurers. The Wolf Lord, who I expected to be an Ogre-sized werewolf, is massive! This is something I have been working on for about a year, thanks to procrastination and being side tracked by other projects, but I finally decided to get it finished up. It was a lot of fun to work on and I'm pleased with the finished result and the little story it tells. The bestiary entry for Erithereans in "Frostgrave: Ghost Archipelago" convinced me to finally paint a special edition Reaper miniature I had been waiting on for way too long. I can't believe it's been 12 years...and that every elephant miniature Reaper put out is currently Out of Print (I know the Bones Elephant God should be hitting retail soon, and he is very nice.) One day I may find a copy of the P-65 Elephant Man, Pachylox. He's one of the sad few who never came over to Bones. Here's Harapan! Another batch of deadly forest encounters, the kind you'd find protecting Castle Stoneskull! 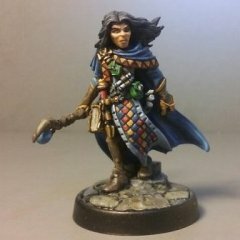 All miniatures are from the Castle Stoneskull set from Bones III. Vegepygmies: Plant Dragon: Death Lilies or something like that! Another set complete! This time it's a group of Eastern Fantasy themed adventurers and encounters. Almost all the minis are from the third Bones Kickstarter, with the exception of the Tengu/Kenku Monk armed with kamas. She's from Stonehaven. The group: The Oni: The Kitsune. The male is one of my favorites...I hadn't even noticed the sake glass in his hand until I started painting! That and his swagger make for a very characterful sculpt. Just some Human Monks: The Kenku/Tengu: This is the non-Reaper one, a Monk from Stonehaven Miniatures: Flock! Just a bunch of Eastern myth themed minis, mostly from Bones III and one Kenku/Tengu Monk from Stonehaven. Oh, and some Myconids from Ganesha Games and Bones III plant monsters. More Mario than myth, I suppose. Oni close-up: Kitsune close-up: I like the male Kitsuine a lot more than I was expecting. His pose, with all its swagger, adds a lot of character. I also hadn't noticed the sake cup he was holding until I started painting. The next set out of Bones 3, various monsters! The Carrion Worm really grew on me! The Temple Dragon is really cool. I hadn't even realized until I was inking it that the base was a statue of a robed woman: The Manticore, who I was specifically hoping for before they announced it during the campaign. It's a classic monster I didn't have a mini of! Lastly, the Giant Cobra. Kind of rushed this one along...he also appears to hide from the camera focus. I thought I'd try to keep a work in progress of the process I'm making in Bones 3. I got distracted/bored during the Death Guard painting, and went back to some of the bones. "Heeey you guuuys!" The Fomorian just called to me. He felt left out when I painted the other Giants, I guess. Orctober got an early start this year, mostly due to me pouring too much green paint when I was doing the base tones on my Bones III Monsters: First, the actual Orcs! I liked the thematic continuation of the Orcs from Bones 1. Painted with them, and only cousins to the theme of Orctober, come the Hobgoblins! There were a few frustrating details on these sculpts, and some odd undercuts, but their paint scheme stayed relatively simple. I don't use Hobgoblins often; I think the only time they've shown up in anything I've run has been premade adventures where they show up as random henchmen. So - my next small project - I cannot keep with just one ... errrr. After having a small but nice talk with @SGHawkins09 and being sent home by the doc to cure a sickness I recently picked up, I had to decide what to do next. As all those wonderful and enthusiatic responses to my previous projects (I mean it - I never had so much response in such a short time) made it near to impossible to just sign off from the forums and disappear into the wilderness, I agreed to take on a different plan. I just grabbed into my miniature box and took some figures to paint them and get them done. And then it struck me: I am at the Reaper Forums yet I missed to paint a Reaper miniature. So I picked out ... errr - let me see ... Troll Slayer Sophie! Yay! - hey! Hooooraaay! Who the heck is Troll Slayer Sophie and when did I buy her? It seems I already started to paint her, but then decided otherwise, stripped *chuckles* her and put her away. Hm. Good point to start her all over again. As I chose her to be the figure I wanted to paint next I had to think about the color scheme I wanted to use. Well. I had no idea. I never really cared about fantasy style, so it never meant anything to me. The things I know about are modern or sci fi. I played a lot of Warhammer40k back in the days. I even wrote fanfiction stories which included the Imperial Guard and the Sisters of Battle ... ... Sisters of Battle ... hm. that could make a great colour scheme. Works well with the flesh tones and still contrasts it. And as Sophie is a demon, the demon/witch hunter theme fits her rather perfectly. I'll take it! Well then - primed her and started painting. But I am not sure - do I want to give her skin the grim dark appearance of an Adepta or a more Succubi-like appearance like ... this one: Succubus Suggestions? Lidless Eye Hobbies: Leapin' Lizards! It isn't easy being green! Especially when you're green and not an Orc, or a Goblin, or a Troll, or a Gith, or a....wow, there's a lot of green monsters! The Froghemoth: I hadn't even noticed the clutch of eggs until I was inking the base! I'm happy with how they came out...reference photos had frog eggs in the entire rainbow of colors. The Jungle Titan. This guy was a lot of fun to paint. I'm not sure what I'll use him as...maybe just an overgrown Lizard King in D&D 5E. The Weregator. He'll likely be used as a Gatorman heavy for Lizardfolk runs. Last and least, Lizardfolk! I apparently forgot to add this set, some simple wood terrain from Bones 3 I painted alongside the Giants. They were saved from a sealant malfunction as well, though the simple colors made it easy. Inhuman. Eternal. Undying. The Guardian of the Maze: The Lord of Death: He Walked with Dragons: Last of his House: The Eternal Hunger: Doomed and Dying: This set was a lot of fun to paint. Sharp detail and simple features. Non-human Undead are always fun and relatively rare in miniature representation. I hope they get a follow-up! Also known was "Wait, hippos really are purple?" These guys are some of my favorites from Bones III. Sadly, the "Isle of Dread" style game I was running ended long before these arrived, but I was recently reading "Elephantmen", which was a good inspiration to get these done. King Hippo. His skin was already done when, during a paint jam, a buddy pointed out, Hippos are not pure grey. I had to greenstuff back in his necklace, and carve out a nostril that wasn't cast properly. I only noticed mid-paint. And of course the zoom shows the mold lines I thought I got... Obadiah Horn. The simplest one, but I like his stance. Ebony Hide, the Elephant. I went with the obvious Zulu theme for him. I couldn't figure out if his club was meant to be a bone or a wooden knobkerrie, but I went with wood.